Star points (J. hoshi, lit. 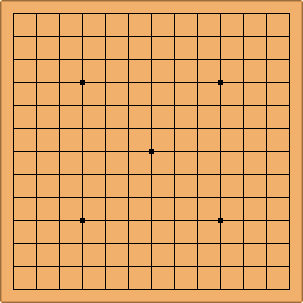 "star") are the nine points on a 19x19 go board marked by small dots, where handicap stones are placed. They also serve as a visual reference for the players. Otherwise, they have no effect on the game. They are one of the named points on the board. Symmetry taken into account, there are 3 named star points: the 4-4 point, the 10-4 point and the 10-10 point. Like other terms in go, the term star point refers not only to the point, but to a play there as well. 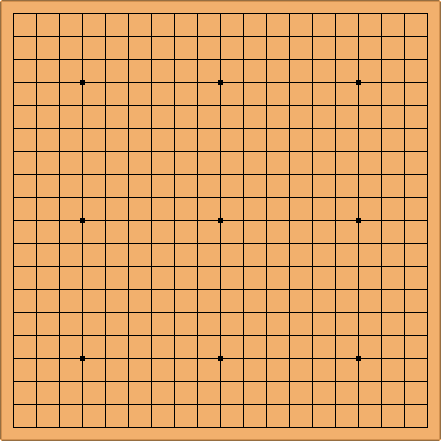 Star point joseki are joseki starting with the corner star point (4-4 point). The sei in niren-sei and sanren-sei is another reading of hoshi; these terms thus refer to "two hoshi in a row" or "three hoshi in a row". 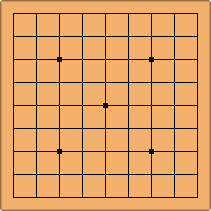 The Japanese term hoshi can also refer to a win (shiroboshi, "white star") or loss (kuroboshi, "black star"), or the circular white or black mark used in tournament grids to show such a win or loss. The Korean term "hwa jeom" or "flower point" originates from traditional Korean boards in which the star points were indicated by flowers. A 13x13 board has only five star points. A 9x9 board also has only five star points. However, some leave out that in the center, some those in the corners.